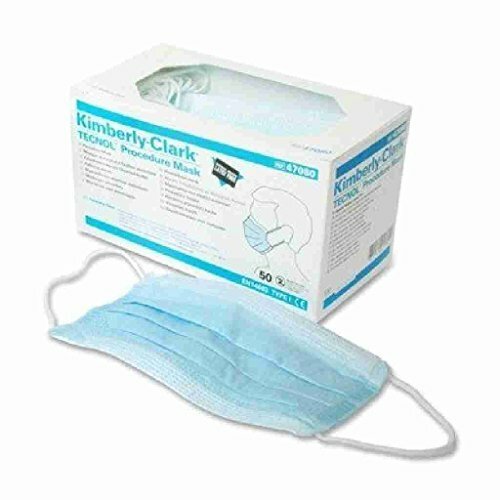 Kimberly-Clark Products - Tecnol Procedure Mask, Pleat, Earloops, Latex Free, 50CT, Blue - Sold as 1 BX - Procedure face masks feature a pleat style and earloops. Use only once in general patient care situations or in care continuum/alternate site arenas. Face masks are latex-free, disposable and nonsterile. Masks are made of polypropylene, polyester, cellulose and paper/plastic-coated carbon steel (nose wire). Procedure face masks feature a pleat style and earloops. Use only once in general patient care situations or in care continuum/alternate site arenas. Face masks are latex-free, disposable and nonsterile. Masks are made of polypropylene, polyester, cellulose and paper/plastic-coated carbon steel (nose wire).